Is La La Land the second (or even third or fourth) coming of the great movie musical? Not exactly. To call it a “musical” seems a bit overblown, as the flick’s songs (by newcomer Justin Hurwitz) come and go more like incomplete yet tuneful doodles as opposed to full-fledged numbers. The choreography is about two notches above a rhythmic walk down the street, and the singing … well … the singing makes Rex Harrison’s trademarked talk/sing (see My Fair Lady, Dr. Dolittle) sound like Adele at Carnegie Hall. Yet, I think that half-assed musicality is all by design on the part of director Damien Chazelle, who was responsible for Whiplash, one of my favorite films of the last ten years. So, please, stop billing La La Land as a lush, glowing tribute to the glory years of the American movie musical. The film happily, gleefully wraps itself in all the tropes of the genre, much like The Artist (the two films are spiritual and stylistic cousins) used silent film to tell a similar narrative of ambitious if downtrodden performers navigating the despair and loneliness of love and ladder-climbing in the City of Dreams (Los Angeles). However, it ain’t a musical – at least for those of us expecting a behind-the-curtain songfest like Singin’ in the Rain or Funny Face. Much like Whiplash, it is a film with music, melodies seeping through every corner of its DNA. And that’s ok. The genre that the film really exemplifies (a genre that isn’t really a genre except anywhere in my own head) is the movie-that-exists-solely-for-the-sake-of-a-final-act-punchline-that-brings-the-rest-of-the-film-into-stark-relief-and-makes-you-go-“oh-THAT’s-what-I’ve-been-watching-for-the-past-two-hours.” Think The Sixth Sense (or anything else by gimmicky M. Night Shyamalan). I’m pretty certain this will be the only review that compares La La Land to a movie where Bruce Willis is a ghost (20-year-old spoiler alert!). La La Land is surprisingly and refreshingly dark, but you don’t realize that until hours after viewing. It unspools in a light, frothy homage to films like The Umbrellas of Cherbourg (which also beats with a candy-colored heart of darkness). Two (literally) star-crossed lovers – Ryan Gosling and Emma Stone – find mutual affection in their shared failure, he a struggling jazz pianist of the purest and most pretentious variety and she a failing actress bouncing unsuccessfully from one insultingly mind-numbing TV-pilot audition to another. Naturally, they fall for each other. It is a musical after all; oh wait, I just said it wasn’t. Much. As their lives spiral up and down and back again (“me here at last on the ground … you in mid-air”), the movie details the toxic effects that unshared, ill-timed success and failure can have on a relationship of creative types torn between each other and egomania. The songs, as they are (“City of Stars” being the most memorable … or at least the most hummable), are used effectively to illustrate the pointed emotional moments of Gosling and Stone’s shared lives. Imagine A Star is Born (Judy and James, not Barbra and Kris – please) structured as the dreamlike nervous breakdown of Dancer in the Dark (directed by renowned sadist Lars von Trier and scored by renowned wood nymph Bjork). I did. Very much. And here’s why. As a musical, it’s unremarkable (I’ve driven that point into submission). 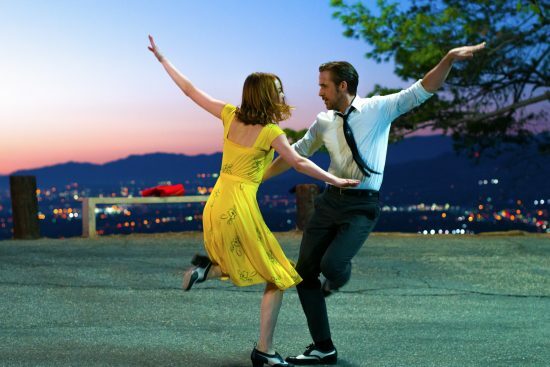 As a treatise on the fleeting nature of time and love and ambition, on the hollow reward of financial success and critical acclaim, on the haunting nature of missed opportunities and second-guessing one’s life choices, La La Land is a powder keg. The first hour? I thought to myself, “This is kind of insipid. Gosling and Stone are charming as always, but they embarrass me a little bit. Why are they so awkward and unsure. Why can’t they sing? Why are they floating on the ceiling of a planetarium? Am I supposed to be moved by this? Is Rebel Without a Cause as referenced in this flick intended to be a metaphor for something?” Well, the characters are gawky as hell because, at that point in their lives and careers, they would be. But, then, life hits this duo right in the solar plexus (plexi? 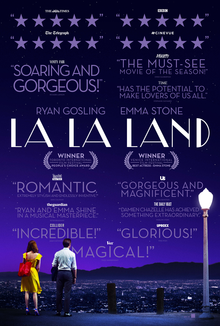 ), and La La Land gets really interesting. Their shabby chic world together experiences a few wins but even more losses. They drift. They fight. They become more sure of themselves and reluctantly admit that life must lead them away from each other. And they sing (sort of). In defense of Stone, her big solo (in the spot of what we used to call an “11 o’clock” number like “Ladies Who Lunch” or “Rose’s Turn” that spins all the key themes into one fist-raising, anthemic exclamation point) is “Audition (The Fools Who Dream),” a full-throated yawlp that shows us, yes, she can sing, and, boy, can she act. Then, THEN, in the film’s final moments, Chazelle hits you with a Gene Kelly-esque montage/remix/rewind/dream-dance ballet (I’ve always hated those, until this one) that puts the preceding narrative in perspective and leaves you gutted, wondering about your own life choices, what has worked, what hasn’t, and what might have been. Now, that‘s a musical. No, it isn’t. It’s something new entirely. That’s why I loved this movie. this is so perky and enticing….I actually want to see this!!!!!! !